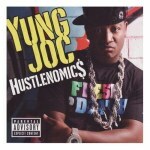 Yung Joc enlists big-name producers and guest-rappers for his passable, but generic, sophomore album. Do we really need Yung Joc? Posing this question at the start of a review probably comes off as more mean-spirited than it's intended, but, honestly, what niche is this dude filling in today’s rap climate? Sure, I had “You Know You See It” and “It’s Goin’ Down” stuck in my head for about half of last year, and there’s a small handful of tracks on Joc’s sophomore outing that are almost as infectious as his name-making hits. But let’s be realistic here, the guy’s not a particularly good rapper, in any arguable sense -- flow, wit, swagger -- and music with his name attached to it is generally best when he has as little to actually do with it as possible. There are literally dozens of Southern rappers reinventing the form as I type this. Yung Joc is not one of them. Take “Coffee Shop”, the first single from Hustlenomics, as an example. Yep, it’s another forced/extended metaphor hip-pop track. In this case, using an, uh, coffee shop as (I guess) a coded stand-in for the drug game. With its bouncy Don Vito production and nursery rhyme-style sing-along chorus, it’s inevitably catchy. As this sort of thing goes, it’s preferable to 50's “Amusement Park” but not his “Candy Shop”. Tellingly, it’s probably the best song on the record, for which credit is due even partly to Joc (The Game kills the DJ Quik beat on “Cut Throat”, which also includes a nice Jim Jones cameo). But, of course, this is America and, more importantly, a subjective medium. Uber-gimmicky Soulja Boy has one of the year’s biggest hits, and the nearly unlistenable Devendra Banhart retains something like a musical career. Thus, Joc has every right to forge ahead, willfully oblivious of his own relative irrelevance. And, naturally, he does what any marginally talented, deeply generic rapper would do in his position: enlist big-name guest collaborators. If this album proves nothing else, it’s that the formula still works: hire A-list producers and guest rappers, and you’re all but guaranteed a passable hip-hop record. Which is exactly what Hustlenomics is to its core, a disposable album that your average rap fan will presumably find pleasing enough for a few spins around the block. Joc’s the Good Charlotte of rap -- not particularly skilled, not particularly “authentic”, just in-tuned enough to what’s moving units to shrewdly follow suit. I do, however, recommend this album to music critics who rushed to accuse Curtis of being the nadir of soulless, charmless rap formula. Think again, friends.